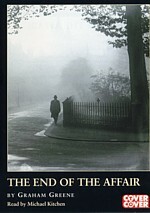 The novelist Maurice Bendrix's love affair with his friend's wife, Sarah, had begun in London during the Blitz. One day, inexplicably and without warning, Sarah had broken off the relationship. It seemed impossible that there could be a rival for her heart. Yet two years later, driven by obsessive jealousy and grief, Bendrix sends Parkis, a private detective, to follow Sarah and find out the truth. Graham Greene was born in 1904. He worked for four years as sub-editor on The Times, and as well as his many novels he wrote several collections of short stories, four travel books, six plays, three books of autobiography, two of biography, and four books for children. He also contributed hundreds of essays, and film and book reviews. He died in 1991. Michael Kitchen is a familiar face on TV with many credits to his name, including "Foyle's War", "the Railway Children", "Kidnapped", "the Buccaneers", "Reckless", and as Jack Turner in "A&E". He has appeared at the National Theatre in "Rough Crossing" and "No Man's Land", as well as with the RSC. His film credits include "Mrs Dalloway", "Enchanted April", "Out of Africa" and the James Bonds films "GoldenEye" and "The World is Not Enough".